Ahkari is a Khajiit pawnbroker that leads one of three Khajiit trade caravans owned by Ri'saad. Her caravan stops at Riften and Dawnstar, and includes Zaynabi, Dro'marash, and Kharjo. Ahkari wears a set of fine clothes and a pair of fine boots. She is equipped with a steel war axe, and carries a selection of upper-class items and gold. Ahkari can also provide some insight on why Khajiit caravans are not allowed inside cities. When first spoken to, she will be surprised, saying "So many refuse to talk to us. They call us thieves and smugglers. I am glad to see that you are not such a one." When asked if she has had trouble with the locals, she will explain, "Mostly it is the Nords. They do not like outsiders in their land, and so we are forbidden to enter the cities. When they look upon us, they see only pickpockets and skooma dealers. It is most unfair, but we do our best to ignore them." As for how long she has been in Skyrim, she will say, "Not long, in truth. 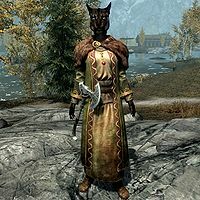 I came to Skyrim after I found myself unwelcome in both Elsweyr and Cyrodiil. I seem to have an unfortunate talent for getting myself involved in misunderstandings with the law. Ri'saad was able to look past that, and it was he who helped to set me up with a trade caravan. Now I work for him." Kharjo will tell you how he ended up as a caravan guard, referring to Ahkari as male: "Yes, I was hired to protect the others as we walk the roads of Skyrim. It is a thankless task and I would rather be back home in Elsweyr, but I have little choice. Ahkari freed me from a prison in Cyrodiil, and now I must repay my debt to him [sic]." This is the merchandise found in Ahkari's merchant chest. These items are supposed to only be available if purchased from the merchant, however there is a bug with the chest. They are restocked every two days. Although the Official Game Guide lists Ahkari as a Journeyman Pickpocket trainer, she does not actually provide any training. Ahkari seems to be involved in illegal skooma trade, as indicated by the smuggler's note in an unmarked location around the back of Whiterun. The letter is odd for two reasons: Ahkari does not travel to Whiterun on her trade route, nor does she have any obvious relation to the 'seer' mentioned in the letter. This could be due to an oversight on the developers' part. Ahkari's merchant chest is hidden in Dawnstar, but it can be accessed if you know where to look. It is located on the east side of Dawnstar, between some rocks just a few paces directly south of Irgnir's House, just to the left of Iron Breaker Mine. The chest is buried under the snow, so it's not visible unless you move your cross-hairs over it. You can take loot from the hidden chest without incurring a bounty, even though what you're actually looting is her current inventory. If you sell her an item, you can head back over to the chest and find it within; if you buy items from her, the gold is also added to the chest. This page was last modified on 27 August 2018, at 07:13.